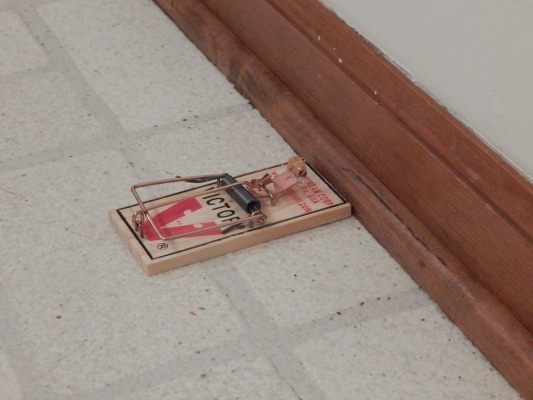 Effective mouse extermination involves more than just setting a random trap in the middle of your living room floor. Although trapping a mouse and protecting your home from future invasions in pretty easy, there are a few simple steps that must be followed to eliminate these pesky rodents for good. Mice, unlike rats, are physically "cute" but the damage and problems they can cause in your home are anything but cute. Mice will choose to make themselves at home in your house or apartment because it offers them everything they need to live a safe life and reproduce: shelter, warmth, bedding material and food. It's likely that humans have been plagued by mice from when they first started forming social groups. As soon as people were stationary in one place for more than a day or two, the keen sense of smell that mice possess would direct them to the food that the humans would have in their encampment. As people settled down more and began to practice agriculture, it made it even easier for the mice. Mice undoubtedly lost no time moving in with people once the first primitive houses were made and the first baskets of grain were stored. The rest, as the saying goes, is history and we have been sharing our homes with mice for thousands of years. The name "mouse" comes from the Sanskrit word "mus" which means thief......actually a perfect name for the rodents. 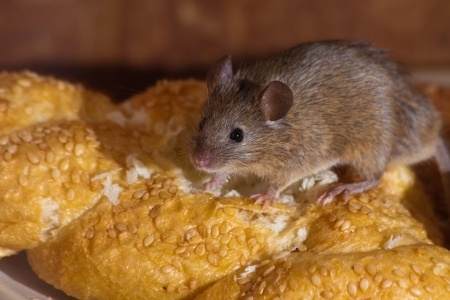 While mice consume tons of food worldwide every year and despoil even more with their droppings and urine, your biggest concern is probably getting them out of your house as soon as possible. Mice also spread hantaviruses through their feces and urine, which you may not even notice. These viruses cause serious infections of the lungs and have a fairly high mortality rate. These mice also serve as vectors for some serious diseases such as Lyme disease, ehrlichiosis and Rocky Mountain spotted fever. Rodents can also spread salmonella and contaminated food should only be handled when you are wearing rubber or vinyl gloves. 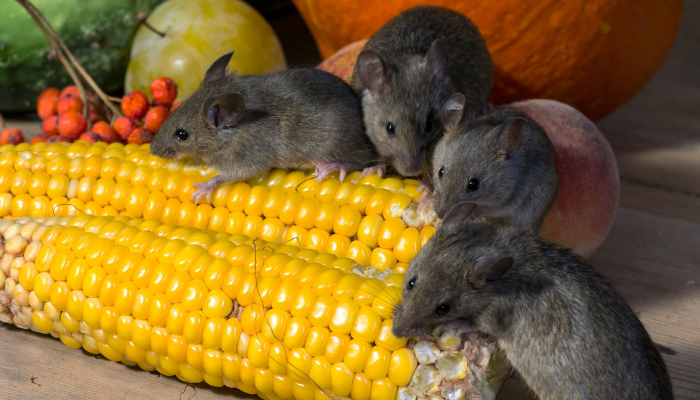 The sooner you eliminate mice, or at least get their population under control, the better it is for everyone in your family. You may think your home is sealed quite well, but in most cases it's actually an open door for mice. Due to the structure of their bodies, mice are able to squeeze through very tiny spaces.......some are able to get through a space no more than 1/4 inch wide. These rodents can use the space around pipes entering the house to get in or any spaces left open during construction. As with nearly all animals, mice have territories and when the number of mice begins to crowd a spot, they will set out to look for new living quarters. Young mice in particular will disperse to find a place to live and breed. 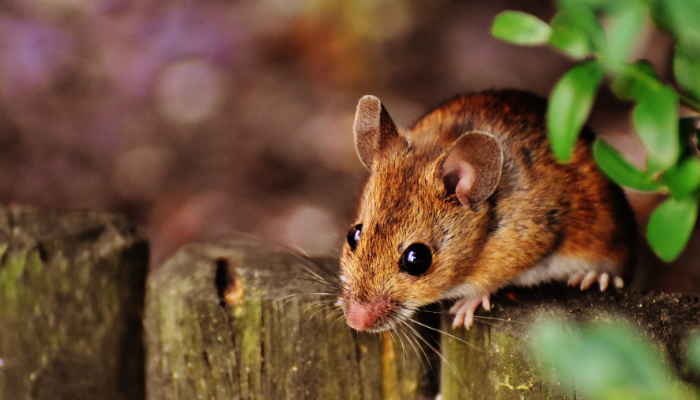 One of the ways that mice will find your home is by following the urine trails of other mice. Mice continually leak urine as they scamper about. When one mouse finds a way into your home, others quickly pick up the trail and you will be facing the beginning of an infestation. Naturally, as soon as the mice have found secure conditions, they will begin to breed. When you have located the suspected entry points for the mice, you can use steel wool to plug them up. Mice don't like to chew through steel wool so it works perfect. Using caulk in conjunction with steel wool works great too. If you find objects that look like black rice grains in your cupboards, on the counter, or just about anywhere else.....they're mouse droppings. Mice produce up to 75 droppings every day and they are simply deposited as the mice run along in search of food. Besides the droppings, you may also find containers of food that have been nibbled into. Mice can chew through cardboard and plastic to get at the food inside. Once containers have been contaminated by mice, they must be thrown out since the food inside will be exposed to urine and droppings making it unsafe to eat. Mice will use different soft, fibrous substances to make their nests and you may come upon these in out-of-the-way corners in a closet or under a sink. You may also find stashes of seeds and other food that mice have stored. It's not uncommon to find dog or cat food as well as bird seed. Another sign you have mice can be when a light suddenly goes out. If it still isn't working after a bulb change, there's a good chance that a mouse has nibbled through your electric wire somewhere. This can present another danger from mice too......the possibility of a fire starting in your walls. You can sometimes even hear them rasping at the wood in your walls with their teeth, usually in the middle of the night. While you probably will never be able to completely win the war on mice, you can fight them to a standstill and keep your home relatively free of the rodents. 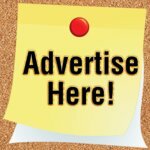 Besides sealing your home as tightly as possible, you will probably have to take some some mouse extermination steps to reduce the mouse population. Food containers must be tightly sealed and cabinets must be checked for holes where mice can get in. Keep cupboards and drawers closed when you're not using them. Don't leave pet food on the floor overnight. Pet food bags should be kept in closed containers as well. 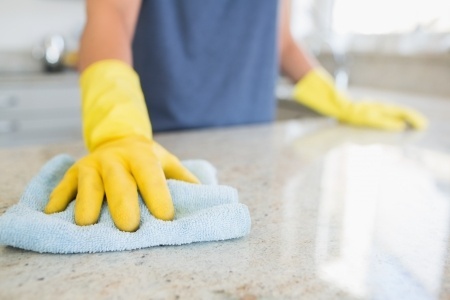 Clean counters and tables before going to bed to remove crumbs and spilled food. Open garbage bags or buckets are an open invitation for mice. Use containers with lids to ensure a tight seal. Peppermint oil is sometimes used to keep mice away as they don't like the odor. Its effectiveness is spotty. Sonic devices are consistently unreliable and a waste of money. 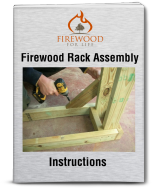 Generally, it isn't enough to take passive measures to keep mice in check and you will have to resort to more aggressive methods. Always remember to wear disposable gloves when you're cleaning up after mice, setting and emptying traps, or setting out bait. The most reliable mouse extermination device is the old snap trap. 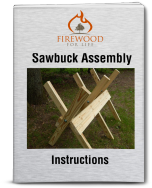 This trap relies on a tightly coiled spring that releases a bar when the mouse tries to take the bait. These traps kill fast, making them very humane. 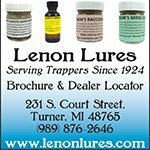 If you are hesitant about using a snap trap, live traps for mice are also available. Of course, you will just be releasing the rodent to trouble someone else. Poisons should be avoided. They will work, but they have several disadvantages; the affected mouse might crawl into the wall and die, leaving you with an inaccessible corpse that will soon smell. Also, poisoned mice can be found by a dog or cat, making your pet very sick or even die. Sticky traps, also called glue boards, rely on the mouse running out onto a very sticky surface causing the mouse to become stuck to the surface. Personally, I believe these traps are inhumane and should be avoided. It's not impossible to keep mice out of your house, or at least keep them under control, but it will take some dedication on your part. However, proper mouse extermination can give you the advantage of living in a rodent free home, which far outweighs the trouble in getting rid of them.